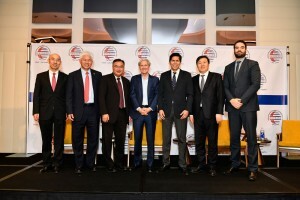 China General Chamber of Commerce – USA (CGCC) and CGCC-Los Angeles hosted “China-US Dialogue: The Path Forward & Screening of Better Angels” at the Hotel Indigo Los Angeles Downtown. 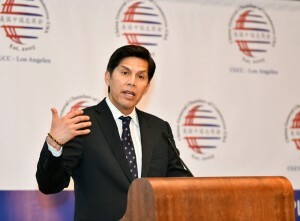 The event brought together over 150 US and Chinese business executives and policy makers to discuss the importance of the China-US relationship. The event opened with remarks by Zhang Xuming, Chairman, CGCC-Los Angeles, President of Avic Intl USA. Zhang emphasized CGCC’s commitment to foster trust and dialogues between China and the United States. Hu Gang, Executive Board Member, CGCC and President & CEO, Greenland USA then gave welcoming remarks. 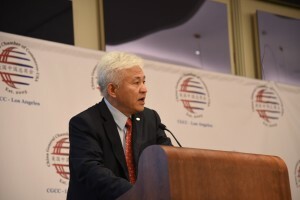 As the venue sponsor of this event, Mr. Hu shared the vision of Greenland USA’s further development in the Los Angeles and New York, and its devotion to create a thriving community at local level. 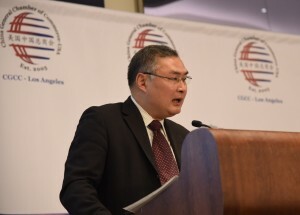 Following Hu’s remarks, Zhang Ping, Consul General of The People’s Republic of China in Los Angeles delivered keynote remarks in which he addressed “The path forward of our bilateral relations lays in the strength of China-US economic and trade relations.” In later part of the speech, he called business communities on both sides to continuously cooperate for the benefits of the people and of the two countries. Consul General Zhang’s remarks were followed by a panel discussion “Chinese Investment in the US: The Path Forward,” joined by Steven Dai, Vice Chairman, CGCC and President and CEO, International Vitamin Corporation; Eric Provenzano, Senior Vice President, AECOM Tishman; and Patrick Duan, Vice President of Operations and SkyRail, BYD Motors. All three speakers emphasized the importance of a robust China-US bilateral relationship to businesses on both sides, and encourage Chinese companies in the US to focus on long-term success. 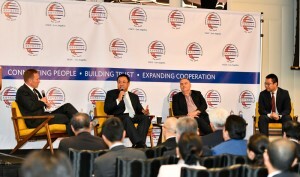 This panel was moderated by Steve Olson, Chairman, World Trade Center Los Angeles; Partner, O’Melveny & Myers. The event concluded with a private screening of the documentary “Better Angels” and Q&A session with William Mundell, Film Producer and Chairman of IKM. William emphasized the huge necessity to share the story that the mainstream media does not cover. 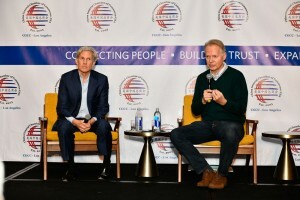 “Better Angels” focuses on the lives of various entrepreneurs and ordinary people from all walks of life whose day-to-day activities are influenced by the China-US relationship. In addition to featuring several prominent Chinese and American scholars and politicians, such as Former US Secretary of State Henry Kissinger, Madeleine Albright, and Vice Chairman of the National Committee of the Chinese People’s Political Consultative Conference Tung Chee-hwa, the film also highlights CGCC member company Golden Dragon Precise Copper Tube Group and how its operation in Alabama has created many job opportunities for the local community. 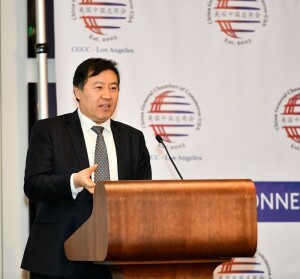 CGCC-USA and CGCC-Los Angeles sincerely thanks all speakers and members for supporting this event and will continue to support and organize events that generate conversations and improve mutual understanding between China and US business communities.